The Bangwe Water and Sanitation Project Phase 2 is a continuation of Water For People’s program work to develop sustainable solutions in unplanned peri-urban areas where populations are growing and basic services are unavailable. This project is similar to the Machinjiri/Nkolokoti Community Water and Sanitation project previously financed by Blue Planet Run. Building on the previous success, the objective of this project is to provide improved water supply and access to sanitation to low-income communities in Bangwe Township where poverty is prevalent in unplanned settlements. Many household in these low-income areas buy water from Kiosks supplied by the Blantyre Board, from households that have domestic connections, or communal tapstands owned by individuals who charge exorbitant fees and fail to maintain water safety standards. 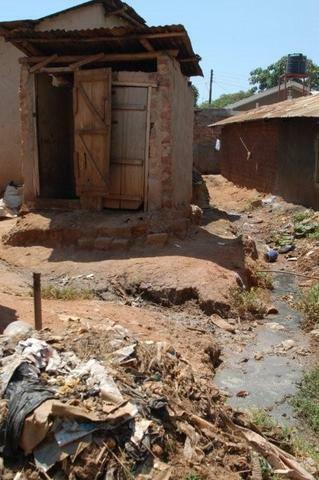 According to Malawi government regulations, each household should have a latrine. This project will serve 50 housholds with approximately 6 people per family. Water For People's program work always includes a health and hygiene education component. This project will focus on hand-washing and safe water storage. This project will construct 2 kiosks with 4 tap stands each that are connected to a piped network. The water is provided by the Blantyre Water Board. The project will also provide improved ventilated pit latrines that are hygienically maintained. Construction of the systems constitutes the first phase of the work; maintaining the systems and health and hygiene education are the critical next phases. The kiosks will be managed by Water User Associations that are independent of political influence. The association is headed by an administrator and has kiosk inspectors and water attendants who will collect tariffs and maintain accounts. The tariffs are well regulated and have been agreed to by the Blantyre Water Board and City Assembly. Plus, the communities in Bangwe have opted for this management system. Water For People will focus on building capacity of Water User Associations with a strong emphasis on project and finance management, maintenance, reporting and recruitment of Kiosk attendants. Water For People will also provide guidance to community on kiosk management options that are available. On the sanitation side, Water For People will work with the private sector to illustrate clear business opportunities in sanitation (such as desludging and regular cleaning of household latrines). Another important component of Water For People’s programs includes health and hygiene education and training of community health promoters. This project will focus on hand-washing and safe water storage. Well over half of peri-urban Blantyre lives without direct access to the municipal water system. Most people get their water from communal standpipes owned by individuals who typically charge exorbitant fees and fail to maintain water safety standards. These owners may also fail to make payment to the Blantyre Water Board, resulting in shut-off taps and greater pressure on those still in service. Peri-urban sanitation consists of traditional pit latrines, often shared by as many as 30 people. Diarrheal disease is rampant under these conditions. And since full pits are abandoned for newly dug pits, space for a sanitation infrastructure is quickly disappearing. The Blantyre Water Board will contribute $2,500 to the project. The community will contribute $2,500 towards the capital costs to the project. Water For People - Malawi will partner with the Blantyre City Assembly, a government entity, to implement the project, although the work will be contracted out to a private contractor with supervision from Engineers from the City Assembly. The Blantyre Water Board will provide treated, piped supply of water. The Assembly will also facilitate the construction of latrines. Again, the work will be contracted out to small scale building contractors. Putting on a funders' hat, i am looking for some personalization of the narrative. The one photo with the woman: is there a name? a story? Can we get some real stories about what the situation is today and then be able to compare it with some followup interviews? Is the water user association been formed together with the respective comm. beneficiaries? How much are the tariffs and are the beneficiaries consented? Is the admin. and the kiosk inspectors going to be paid? If so how much and where is the money coming from? What are the safety standars you have put in place for the users since you will also be getting your water supply from the same supplier? How does the project relates to the overall water supply resolution policy? I looked the the project data and there is no updates or reports. It would be very helpful to know the progress of the other project, some photos, learnings, etc. Especially, how the WfP Malawi office works with the implementer and where the relationship is headed. - The water users associations. As far as I can see, they only have to hire a kiosk watcher that collects the money and to pay the (public?) water company ? What is their added value in the set up op the project and in the service delivery ones the water is running ? - The households interested in an improved latrine. Do they contribute for construction ? How are they selected ? Do they play a role in the water users association ? in the hygiene promotion program ? - The water company. Do they have a strategy with respect to water service in poor areas ? How do they communicate with water users and their associations - questions about transparancy, good governance, pro poor strategy ? And how does this project contributes to this ? The Water Users Association play an integral role - besides collecting payments - a role the requires significant financial management - they are drivers and implementers of the hygiene promotion program. The association has the added value of organizing the community and increasing its capacity to initiate and manage other projects. The households do not contribute to construction of the latrines. One of the major strengths of this program is that the private sector has a well defined role to provide the contruction and service, ensuring their viability. Another important part of the model is that the households are self selected. Water For People has a very strong relationship with the Blantyre Water Board and that relationship is key to their "strategy" for the poor areas. Together we are developing systems for transparancy, good governance and support for the poor. by Maarten Schröder, Water for Keren Programme, dob foundation. 1.The project focus is on a selected sub-community of 2300 individuals of a shanty town community, of which over 50% have no access to regular water supply services. How were the beneficiaries selected and how does this project relate/contribute to the general resolution of water supply security to the entire deprived community? 2.How do the Water User Associations relate to the local authorities and water board, e.g. do they have a legal status, a weight in planning, ownership? 3.What is the estimated physical/economic/financial sustainability feasibility of the unit public standposts? 4.The discussed concept of commercialised eco-sanitation de-sludging seems an excellent concept of a physically, economically and financially self-sustained solution. Could this possibly be extended and linked to water supply in terms of economy and financing? 5.Would education of personal hygiene with focus on water storage and hand washing be effective enough without proper bathing, laundry and toilet opportunity (be it in-house or public)? We generally conduct mapping and needs assessments in the regions where we work and based on the results, identify the communities with the greatest need. Currently, we are working in 4 low income areas outside Blantyre with a plan to reach all the communities in that defined region. The Water User Associations are legally recognized entities that are independent of the Blantyre Water Board. Ideally we would like to link the desludging operations to the water supply and are exploring opportunities to develop a model for the provision of full service water, sanitation, and hygiene promotion services. We would prefer to have all areas of health and hygiene emphasized, but we emphasize handwashing because it is the most effective behavior to prevent illnesses. The challenge is achieving behavior change - to ensure sustained change we promote proper handwashing at the 4 critical times, after visiting the latrine, after handling children feces, before preparing food, before eating food and also water storage. 1. You need to revise your start (and presumably your finish) date, as the current info has you starting April 15 of this year. 2. Why are only 300 people getting sanitation, whereas 2,000 people are getting access to water from the kiosks? Do the other 1,700 people already have access to latrines? If you are intentionally not supplying sanitation, why is that, especially given that it is the International Year of Sanitation? 3. Is there already water being supplied to the school? If not, perhaps you should add that to your proposal. Will the school ne willing/able to pay for the water? 4. 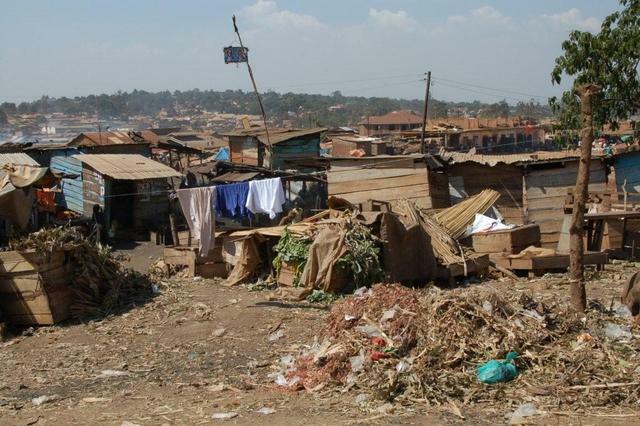 You mention that “Peri-urban sanitation consists of traditional pit latrines, often shared by as many as 30 people. Diarrheal disease is rampant under these conditions. And since full pits are abandoned for newly dug pits, space for a sanitation infrastructure is quickly disappearing.” Given the relatively modest cost of properly constructed pit latrines, perhaps you should solicit some funding for them. Are families likely to be willing and able to substantially co-finance (say 70% or more) latrine construction? Would the benefit of co-financing of latrines attract significant interest among households? 5. Is there any possibility of hiring somebody (or more likely several somebodies) to de-sludge the latrines so that they don’t just get filled up and abandoned, causing the space problem you mentioned? Would people be willing to pay for de-sludging? 6. Operation – How much are the water tariffs? Are people willing to pay a tariff sufficient to cover all water production and O&M costs? Actually i would like to get more clarity on the number of people getting water. The calculation seems to come from gov't regulations, not any estimate of population or population density. Gov't regulations will not cover use or abuse. It could be that 100 people use it or 5,000. Is there any estimate of households and/or population density or ...? I realize that data in these places is hard to get, but that should be some of the value the implementer/partner/ngo can provide. That is a challenge we face in most of our country programs. Through our World Water Corps program, we have been able to gather baseline data on water and sanitation status in some of regions where we work. The mapping involves physical marking of water points to determine coverage levels. So far we have conducted mapping studies in municipalities in Honduras, India and we have a mapping team schedule to go to Blantyre, mid August. 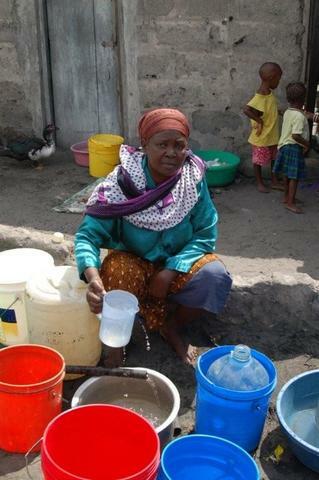 We hope to a better sense of the number of people getting water. Baselining can be difficult. Hopefully results can be verified through a better process. Seeing the final report of your earlier project (http://www.peerwater.org/projects/46) i notice that even after the project completion the numbers of beneficiaries are calculated using gov't rules. Baselining can be difficult. Hopefully results can be verified through a better process. Seeing the final report of your earlier project (http://www.peerwater.org/projects/46) i notice that even after the project completion the numbers of beneficiaries are calculated using gov't rules. "There was an error in terms of beneficiaries in relation to government standards per shallw well. According to Government standards, 1 shallow well should only serve upto 125 people and not 250 people. 250 people is for a deep well of about 45m. Hence the beneficiaries change from ..."
After completion did you get any data on use of the wells? Having an office in the country and an active volunteer program, it should be possible to see really how many people are using it. The gov't rules are acceptable for estimation, but it would be good to get some reports based on visits and interviews as to actual usage and operation. Thanks for your thoughtful questions that I will answer in the order asked. 1. We anticipate completing the project by the end of November, especially since planning began in April and the partners and community have been mobilized. 2. The sanitation effort is at the household level and under this project 50 families have shown interest or committed to getting a latrine. The water project is communal and therefore serves more people. However, our plan is to provide 100% sanitation coverage and we are continually educating the community on the benefits of having a household latrine. 3. The water and sanitation component has been funded and is currently underway in Dalinda. 4. This is a great question. We have developed a model that includes a loan scheme where families can purchase an eco-sanitation latrine and repay by cash or by selling the compost to sanitation promoters, who will service the latrines (de-sludging – as mentioned in your next question). These promoters have an opportunity to start a business and expand their market over time by bringing more families into the initiative which increases the amount of compost they have available to sell. 5. Currently, families are purchasing water at 5-7 Kwacha/per 20 liter bucket at household or communal tap stands that are owned by individuals. Our aim is to charge 2 Kwacha/per 20 liter bucket. Pls give costs in US as well as local currency, so we can compare relative cost of services provided among the various proposals. 1. It is indeed very hard to charge the villagers for water in the developing countries the idea is 'water comes from the sky and it is free'. In the budget there is a fund allotted for the partner projectstaff and and also for capacity building for water user association, etc for which I presume the annual maintenance cost is USD808. In our dugwell project the fund for the partner projectstaff is under training head and it is for one year while the water maintenance is supposed to be done by the beneficiaries from the second year and the field workers would only go for inspection every month and record a few variables. That way they check upon the maintenance. These field workers continue to work on the next year's construction and training projects in the same area. It is indeed very hard to convince and teach/train the users to maintain their very own water supply. Please make sure that the beneficiaries contribute monthly and raise funds to pay the water association to make it sustainable otherwise in the long run it would fail unless there is a resolution made and kept in the local government office to help the user community to take action if it fails well ofcourse they would pay some sort of tax either directly or indirectly (land, sales tax on consumables etc) to ask for accountability from the government. My questions are same as the others hence waiting for the reply. 2. In the third picture a women is seen to be using a jug to fill up the bottle, can she use a flexifle plastic or rubber pipe (about 3 feet long) to fill the bottles to avoid unwanted contamination? Water does indeed come from the sky and the ground or river) and it is indeed free. However, pipes, pumps, electricity, water technicians, accountants, chlorine, filters, etc. are not. While I clearly understand the need to educate people about the rationale for co-finance water (and sanitation systems), if that marketing effort is unsuccessful, personally my feeling is that if people are not willing to pay, go somewhere else where people are willing to pay. As the old saying goes, there is no such thing as a free lunch. Hi Rick I am sorry to say that i don't agree. If we go to the people who are willing to pay only what happens to those who really cannot pay? Leave them to die? You will not believe this: Amongst the dugwell beneficiaries of the dugwells that were constructed between 2001-2004, under the Kolsur panchayat, many user are still not paying (the monthly payment is ONLY 25 cents/Rs.10 per family) because they don't care whether they die from arsenic or not beacuse they don't see anybody dying in the family nor in the area etc from arsenic effects. But the field workers did not stop. We have various strategies one was to let the people drink free of charge whole of 2006 because many stopped using since they had to pay. And we thought that since they will get the habit of drinking better quality water they may start paying to get in 2007. But no same case. Still many were not willing to pay. So the field workers started to visit these families every week and started collecting as low as Re.1 per week. Now they visit twice a month and they have been instructed to go once a month to collect money between Rs.4-10 what ever they can contribute. This fund is used towards repair work mostly and theoline of the respective dugwells. It is important that the field workers visit every month until the CBGs (community-based- groups) get habituated to apply theoline and also purchase it from the theoline distribution center(s) on their own. The scenario in the Gaighata area is different because there are more number of deaths due to arsenic in the villages, and people themselves are very eager to learn and manage their own dugwell. Please don't deprive the poor, teach them how to generate funds, help them to work and produce something and find a market for them to sell their products but never avoid them because they are poor. Well there are some who are literally LAZY! I am sure there too may be some ways to address their problem!! That is fine to teach them how to generate funds by help them to work and produce something and find a market for them to sell their products. However, my understanding is that income generation is not the purpose of this forum. It seems that what you need to do is determine how best to educate these people about the problem. If your efforts are unsuccessful, and they continue to place no value on using theoline or some related response, then that's their problem, not ours. There are many problems in the real field that need to be tackles. Such as: It is very discouraging to see dugwells being sabotaged by the local government offices called panchayats. There are reports on deep tubewells being installed right beside dugwells and in one recent case the tubewell water shows higher arsenic (90PPB) than the dugwell (6PPB) water and now the community is regretting. They are back to the dugwell use. The communities are learning from their own mistakes but we had to show them the arsenic reports of the lab set up by UNICEF. There should be some one to teach them, for which continuous monitoring and awareness is required that costs too, right? And this would go on until the system is fully established in the culture that may take 10-20 years like the use of colgate toothpaste or powder is common in the villages and replacing neem-stick or/and ash, which perhaps were better. PW-AWS is planning on helping the communities to generate funds by setting up (means training to produce) micro-cottage industry type products like bio-degradable jute pots for plants that are sold in the nurseries, and other jute products and also grocery bags made of cotton and paper too perhaps. We are just at a discussion stage with a marketing company that is already engaged in another arsenic district of West Bengal. Funds for that may be applied elsewhere. Will give updates next year if this project materializes. That is their decision, not ours. I find it very difficult to believe that these people cannot pay for good quality water costing only $0.25 per month. It is difficult to believe that a family cannot come up with that small amount of money. Instead, that suggests that that they are unwilling to pay because they think that they might be able to get it for free. Providing free services undermines other people's willingness to pay. If everyone pays some modest amount, then there will be more services available to meet more peoples' needs, instead of catering to free-loaders. When people don't pay for services, they effectively reduce the access of other people to those services. How many of those people smoke cigarettes / biddies? How much do they spend on that? Thank you for your comment. We completely agree that the tariff is key to sustainability. Sorry for any confusion, the picture is a "before" picture and depicts the situation prior to our intervention. Thank you for your comment. We completely agree that the tariff is key to sustainability. Sorry for any confusion, the picture is a "before" picture and depicts the situation prior to our intervention. This seems a usefull and well thought out project. But unfortunately the forum discussion has not lead to clear insight in the economic, organizational and political embedding of the activities. Therefore sustainability is our concern. The proposal seem to be fine but there is need to answer the questions asked to clear some doubts. The annual maintenance cost is high (USD808) and since WFP is helping to develop the Blantyre Water Board through these projects my advice would be to help them to establish a tracking program that is NOT hard at all. Tracking and surveillance sounds complicated and difficult, it is not once the template is on the computer. The key products needed are GPS (handheld), computer and microsoft excel and earth google (free software) for mapping the location so that the implementers and the field workers know that any time anybody can visit for inspection. This would avoid false reporting. Weakpoints: High annual maintenance cost that would affect sustainability unless commit to assist for long term and reports of past projects are inadequate and what we need to see is the number of people drinking water. Given the very low or non-existent willingness of the proposed beneficiaries to pay for any of the proposed services, coupled with the apparently uncooperative local government agency (the applications states that "dugwells (are) being sabotaged by the local government offices called panchayats", and that only 45% of the budget is dedicated to actual construction of the infrastructure, I think that there are other projects that could better utilize BPR/PWX funds. It is good Ideal to use government expertise. The role of the user is indicated. The project seems to benefit large number of people. This project is difficult to evaluate regarding the role of different stakeholders. The relationship between water users committee and water board and between water board & water committee and the municipality remain unclear. On the other hand it is encouraging to see the efforts for water supply and basic sanitation with new approaches conducted in peri-urban areas. My rating is not reflective of its potential success, but from a perspective of a funder. We funded exactly this same project (phase 1) in January in the same town and with the same partner. Since we have heard that there has been a delay, but no other report on how the work is going or the partnership is turning out, we cannot recommend this project. This might be a good project to bring up at the next funding round (if it has not been funded).